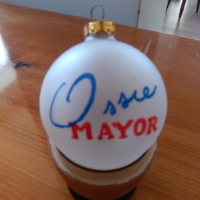 This is a clear christmas tree ornament with the words "Ossie Mayor" printed in cursive. Not much else is known about which election for Mayor of Springfield it was for. Certainly, it was used as a give away type promotional item. Ossie Langfelder won the 1987 Mayoral election and held the office until 1995. He lost the election that year in his attempt for a third term. He was a Democratic candidate. The 1987 election was the first one featuring the new mayor-aldermanic system. “Campaign Promotional Christmas Ornament from Springfield, Illinois Mayoral Election,” UIS History Harvest, accessed April 22, 2019, http://uishistharv1.uis.edu/items/show/210.